You will feel satisfied you have provided your child with a first class celebration by renting JumpMaxx’s Dream Castle. Busy Kids Make Great Parties, and Jumpmaxx helps you do that for less. 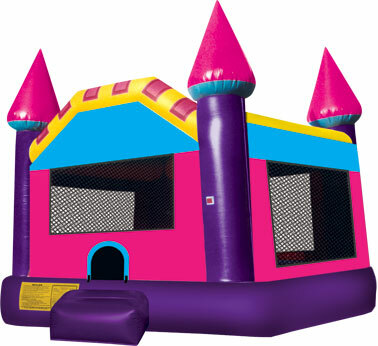 We want to be your Moonwalk Bounce House and Jumping Castle company. This castle blends in with any party theme and it has a small footprint to fit into smaller yards. It’s vibrant colors seem as though they flowed off a pallette. They are guaranteed to brighten any young princesses day. Yet they will not overpower your theme. JumpMaxx has worked hard and long to provide to you the most unique and wonderous inflatable products to entertain your family and guests at any party, event, and fund raiser. JumpMaxx prides ourselves in providing America with newer, cleaner, high end entertainment with inflatables like the Dream Castle and many others.